On the edge of Macon stands a shop where VWs go to be renewed. Take the I-16 exit and then the 1st exit to Gray Hwy & Spring St.
Left off the exit, travel N on Gray Hwy for about 2 miles. Turn right at the CVS onto Shurling Drive. Drive about 5 miles to the county line, where the road changes from 5 lanes to 3 lanes. That's the Jones County Line. The mile markers start at zero there. Continue driving and we're located 1/4 mile past the #8 mile marker on the left. If you reach the traffic light at the intesection of Hwy 49 and Hwy 18, you've gone about a mile too far. Call us. We'll come get your car. We offer free transportation for repairs or services over $350.00. If you're spending money on a medium to large service or repair, we'll drive or tow your car and there will be no extra charge. Just call us and let us know where the car is and we'll take care of it. Yes, we're that good. 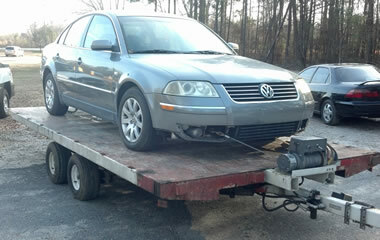 Towing from Warner Robins (for jobs less than $350) is $75. 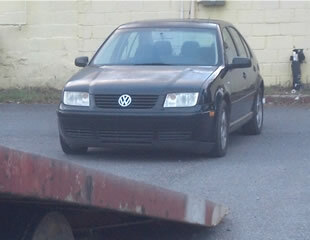 Towing from Macon or Milledgeville is $60. This page last updated 02/15/15 by Rick Sherrod.